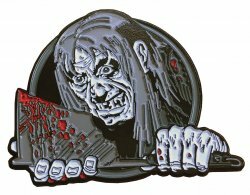 Fans of Tales of the Crypt can decorate their jackets with this extra-large enamel pin of the Keeper (holding a bloody axe!)! Dual pin-back metal badge. Brand-new on card backing in factory sealed bag. Measures 2 inches wide x 1 3/4 inches tall. We also offer the Tales from the Crypt logo enamel pin while supplies last! Use the convenient Buy Both button below, if you dare!